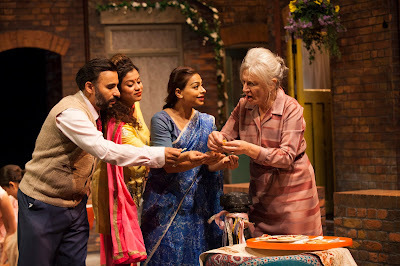 Anita and Me, currently playing at Theatre Royal Stratford East covers Meera Syal's life growing up in 1970s West Midlands. It was an era of chain smoking, flares and glam rock. But something feels lost in the translation from book to stage production. It feels like it is a series of random encounters with northern stereotypes. Not much happens in this slice of life comedy-drama and the accompanying music often serves to distract from the story making the show less involving than it should be. But it is not entirely a lost cause (particularly if you have to read the book as part of your GCSEs). There are some fun moments of cultures clashing, such as when Meena sings her favourite song from the radio only to have her family give it a distinct Indian rhythm with a tabala accompaniment, percussion and overly enthusiastic hand clapping. Most interesting are the themes of being out of place, a long way from home and the sense of family. Briefly some sharp observations are made about British values (or lack of them) around family, but too quickly they get dismissed by a song and a dance. The piece needs to decide whether it is a musical or a play with music. It might be more successful as the latter, particularly if a decision is made to remove a painfully awkward song about African missionaries. With a plethora of racial insults for lyrics, it just is not written well enough to be considered ironic. New musicals are delicate things, but it should take more than a thin sounding electric keyboard and a few songs cobbled together to make them resonate with their audiences. The large cast try hard with the material and give the production class with some nice performances. 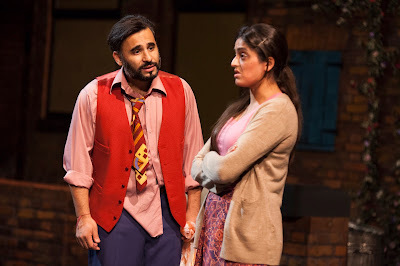 Ameet Chana and Ayesha Dharker as Meena's parents get the opportunity to give some shading to their characters, briefly giving some insight into why they came to a small village. Mandeep Dillon manages the difficult task portraying Meena, who is caught between two cultures and wanting to identify more with the locals, despite what they think and do. Anita and Me runs at Theatre Royal Stratford East until 21 November. Look out for their new adaptation of Robin Hood for panto season which starts from 5 December.